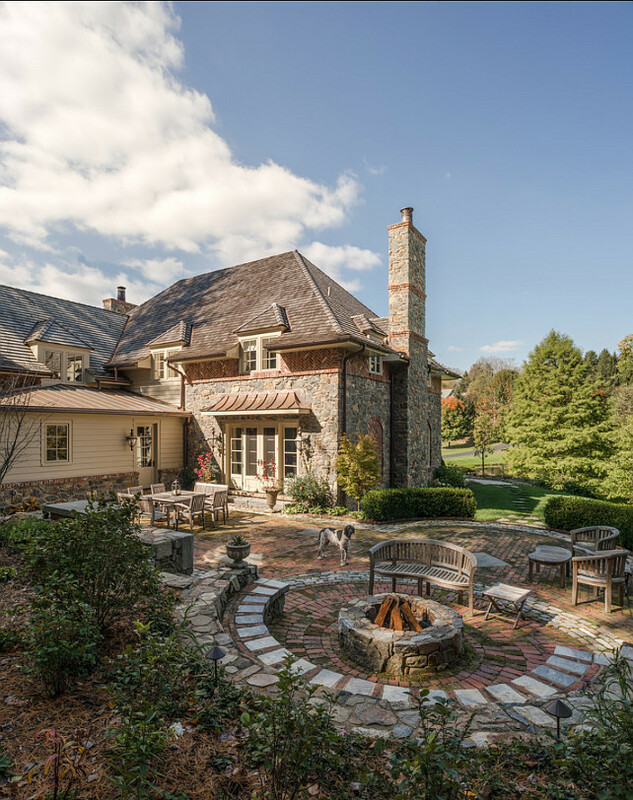 Located in Chadds Ford, PA this traditional home was built for Scott Porter, his wife and young twins, with a timeless approach. His architectural inspiration was the stately homes of Britain, which artfully combine soaring expanses with cozy niches. 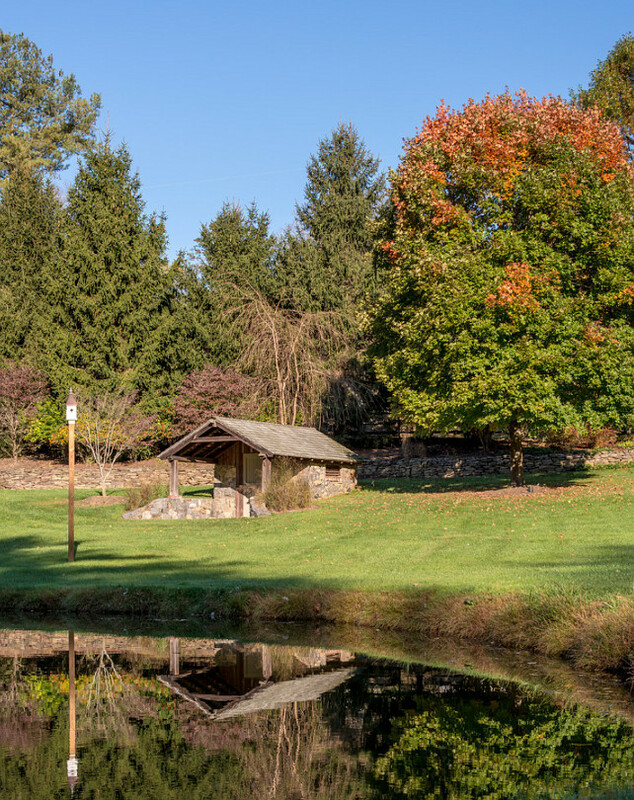 The estate, on a sylvan swath in Chadds Ford, sits on property once owned by his brother, Cory. 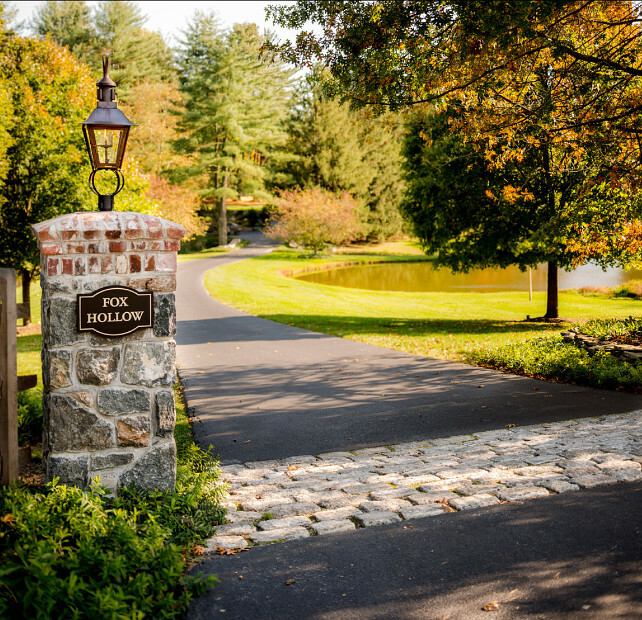 It is across the road from the home of their father, ardent thoroughbred owner Rick Porter. Scott, the founder of Porter Construction, worked together with the architects from Archer & Buchanan Architecture, Ltd. to build a home that has traditional roots that will, undoubtedly, survive the test of time. Stunning pond and entry pillars with gas light. 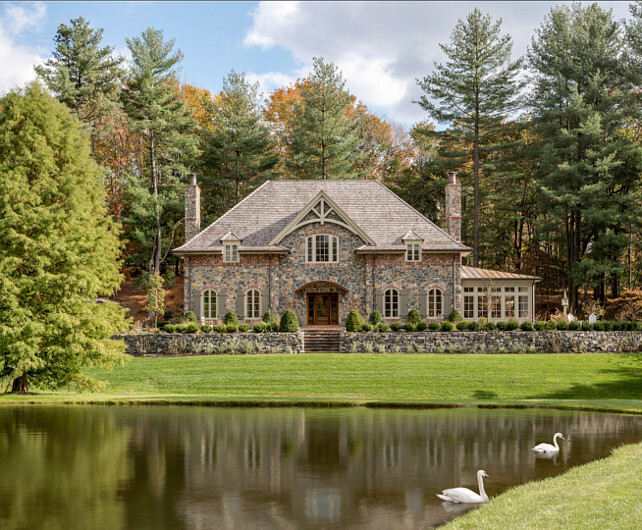 The stone exterior adds a timeless appeal to this gorgeous home. 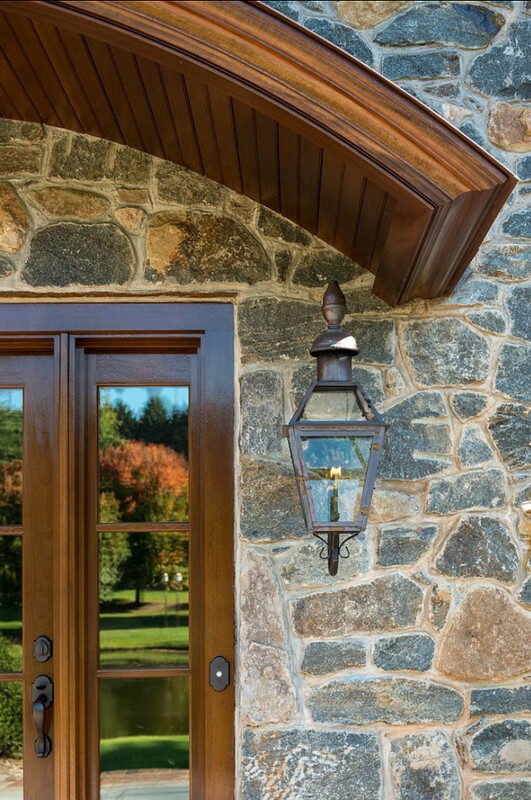 A lantern is always a classic choice, and in this case, it goes perfectly with the architecture of this house. Similar lantern lighting can be found at “Bevolo Gas & Electric Lighting”. 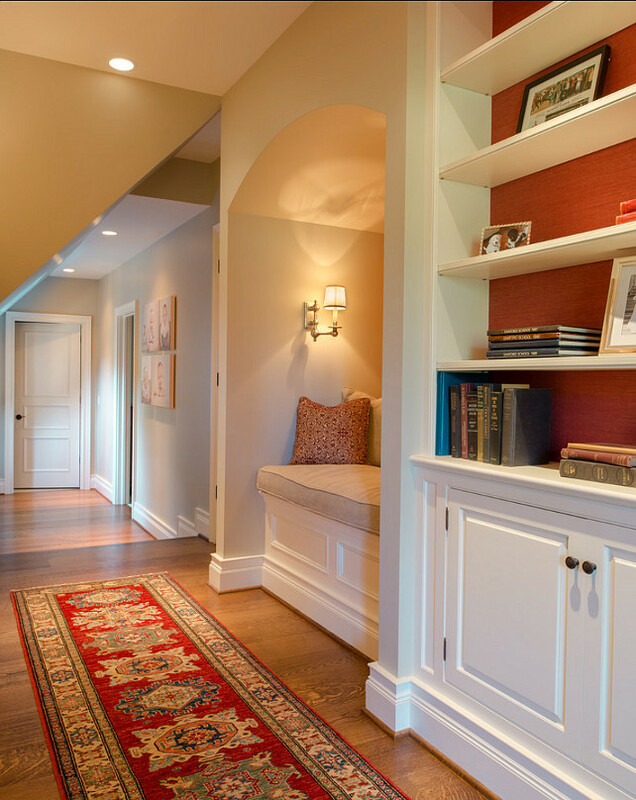 With a traditional approach, the entryway feels elegant yet homely. Note the peaceful country vistas. 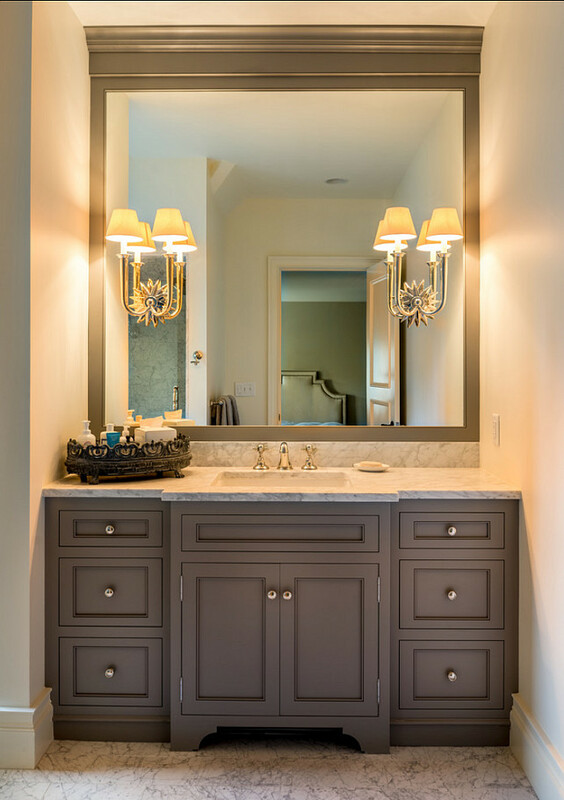 The sconces are by Urban Electric Co. in Charleston, S.C. 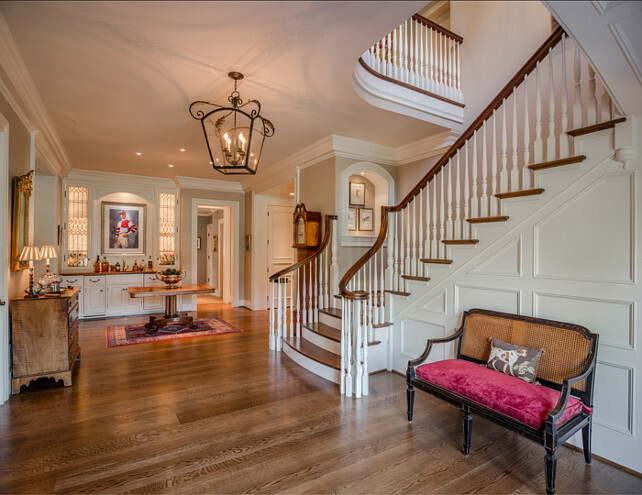 This is a very spacious entryway and carries gorgeous flooring and detailed millwork. Lantern is by Chapman Co. 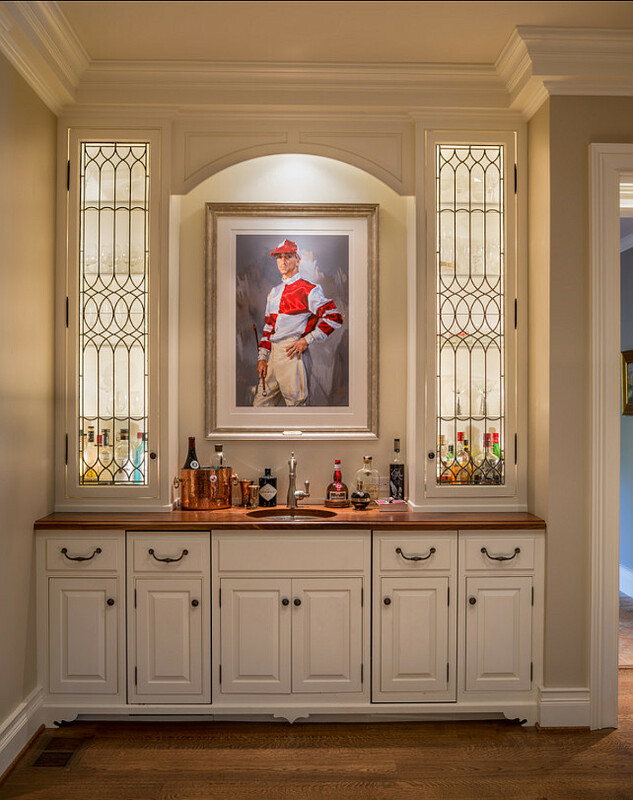 Located at the end of the entryway and between the kitchen and dining room, this space is used as a butcher’s pantry and bar. 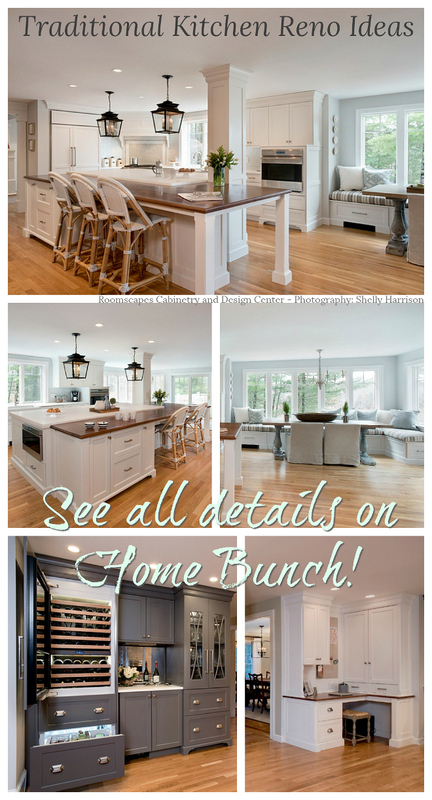 Its cabinetry is pure inspiration! Beautiful portrait of jockey Ramon Dominguez. 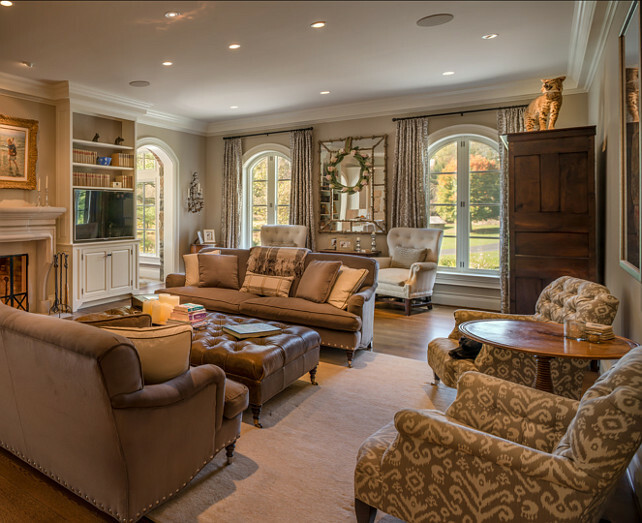 Fireplace is carved Indiana limestone – much more affordable than French limestone. What a warm living room! It feels all grown-up and sophisticated. 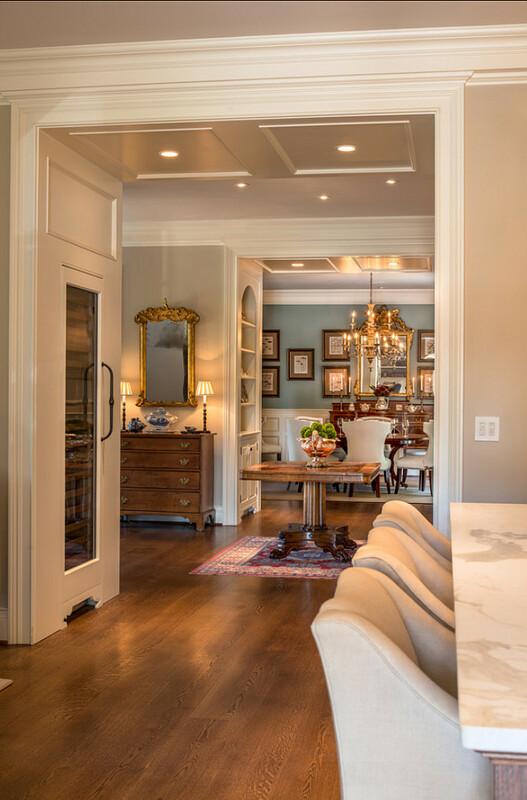 The den is located by the dining room and it would be a lovely place to entertain your guests after a dinner party. Similar Paint Color: Benjamin Moore Middlebury Brown HC-68 in Satin Impervo. A view of the dining room (similar paint color: Benjamin Moore Buxton Blue HC-149) towards the kitchen. Hardwood floors are white oak, quarter sawn in planks 11 inches wide. 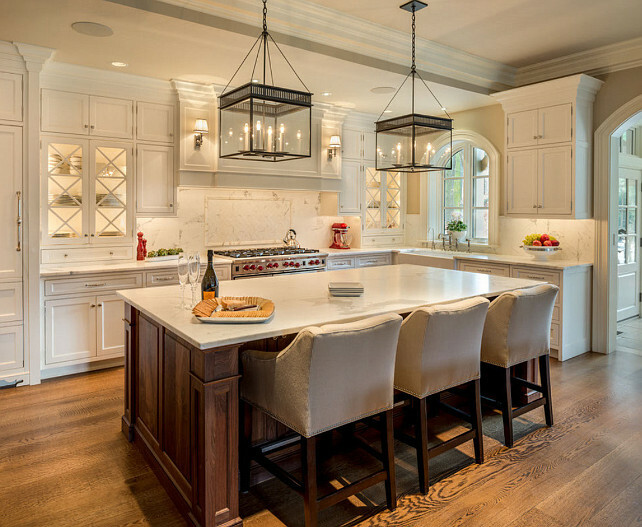 With striking architectural lines and a practical design, this kitchen offers beauty without compromising on useful space. 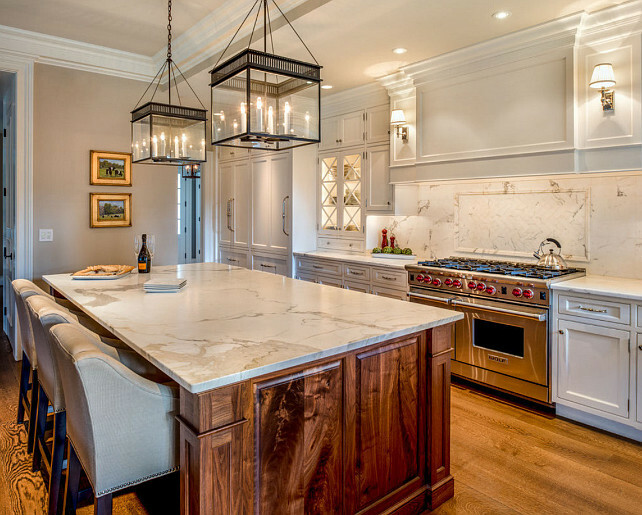 Countertop is Calacatta Oro marble. Island is dark stained walnut. Isn’t it gorgeous? 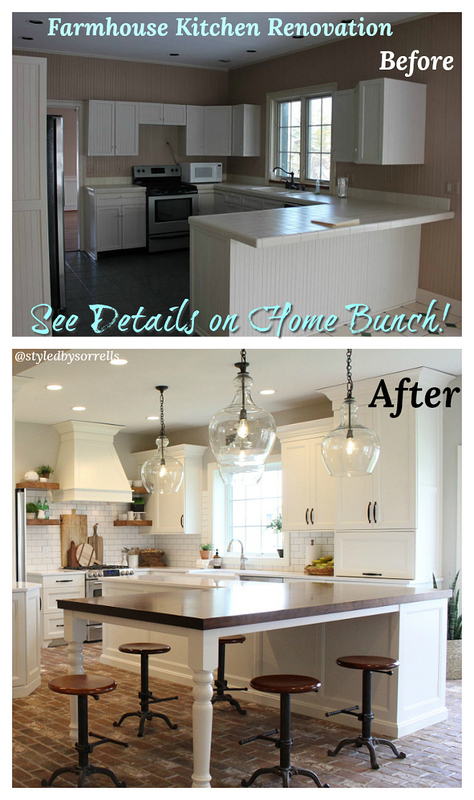 I also love the sconces and backsplash. 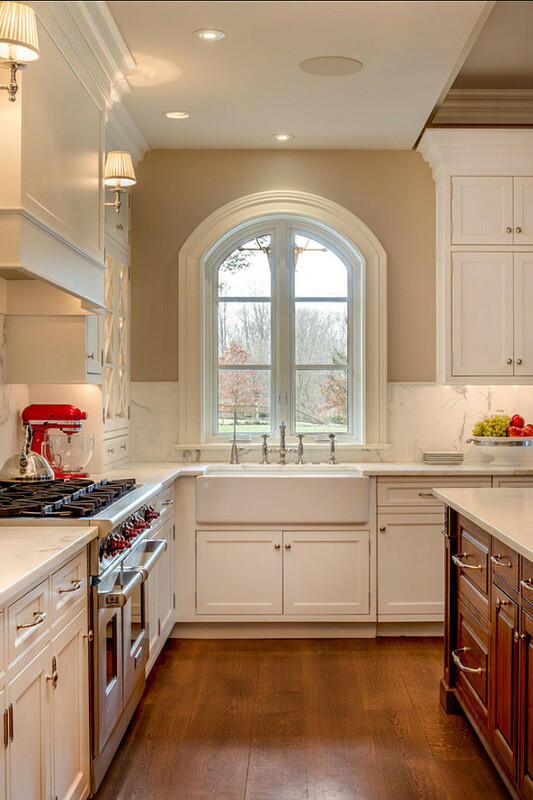 A fireclay apron sink from Rohl sits under a beautiful arched window. Range is a Wolf 48″ Gas Range. I love the wallpaper in this powder room. Subtly chic! 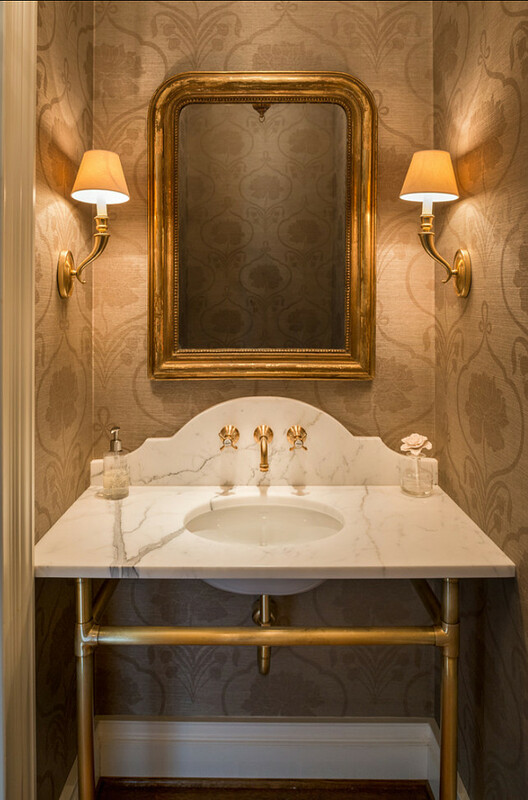 This marble vanity was custom designed by the architects. 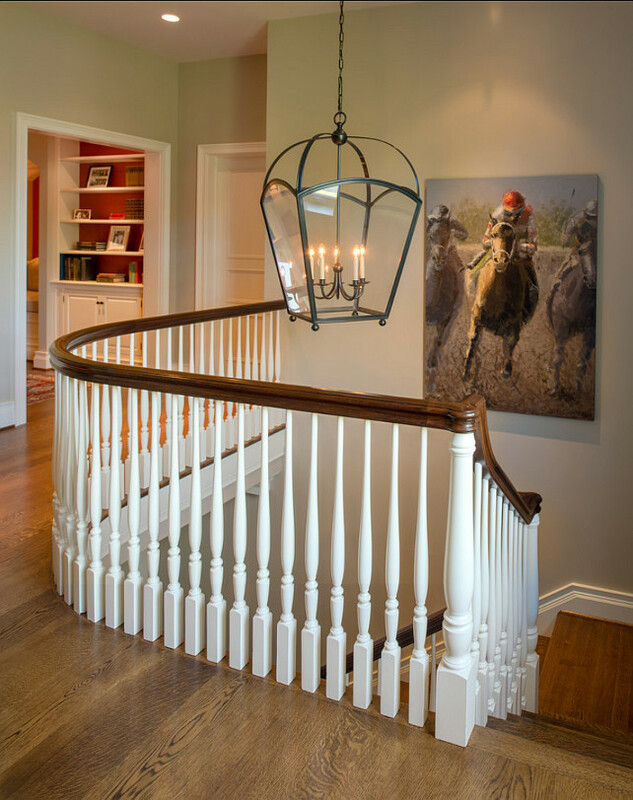 Traditional spindles and beautiful hardwood floors are the highlights in the staircase while a beautiful piece of art creates a dramatic focal point. 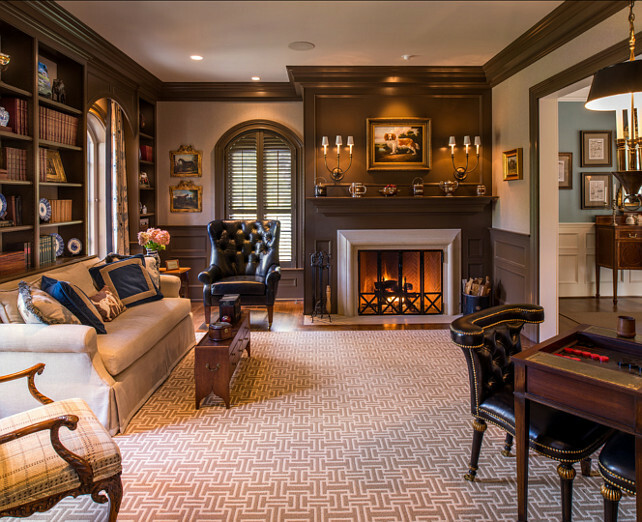 The landing area offers a comfy zone for reading or just day-dreaming. Wallpaper in the bookcase is grasscloth. 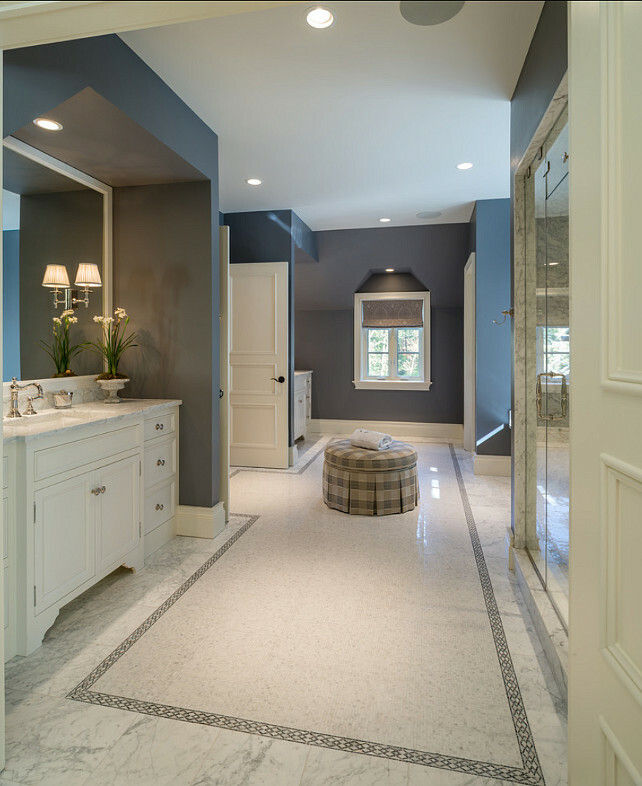 In the master bath, polished mosaic marble is set in a rectangle on the floor, surrounded with large tiles of honed stone to create the effect of a sparkling carpet. 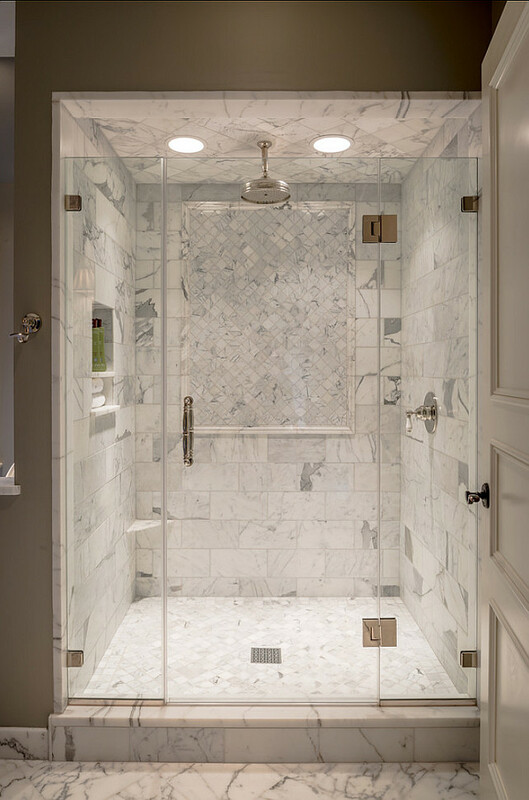 The shower in the master bathroom was yet another well-designed space in this house. Marble tiles of different sizes were used to create interest and contrast. 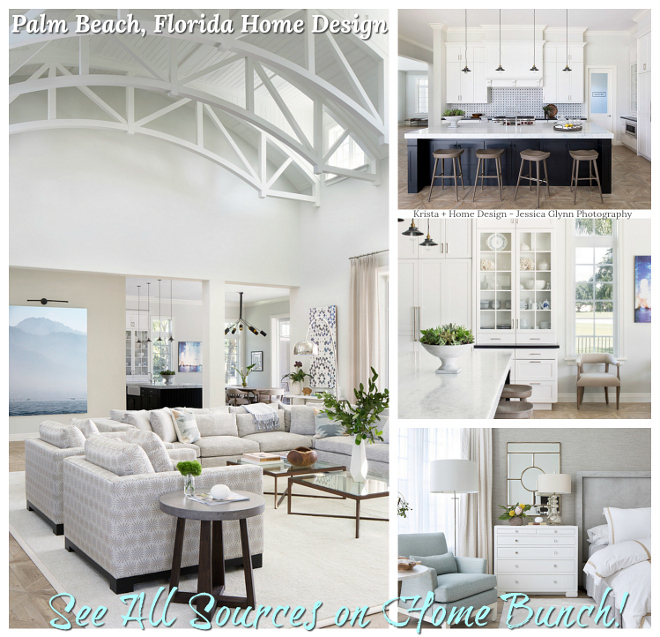 All the second-floor baths are done in a timeless palette, with Calcutta marble floors, countertops and shower surrounds, gray walls and polished nickle fixtures and lighting sconces. This is a combination you never get tired of looking at. 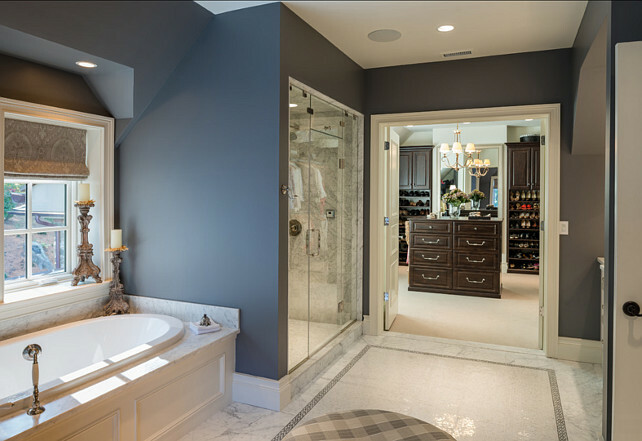 Take this bathroom for example, it is subdued and smart. 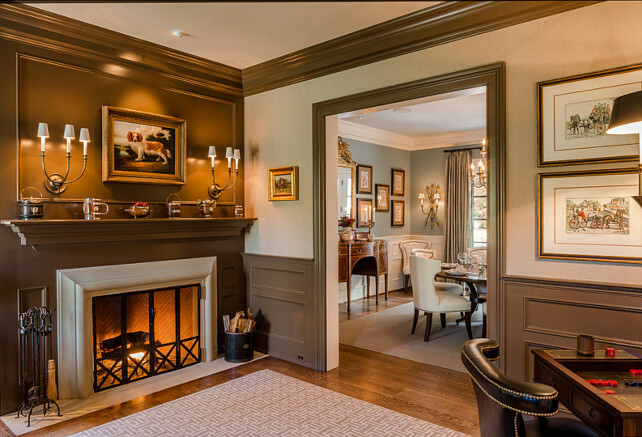 I love its charcoal paint color and also, the sconces. 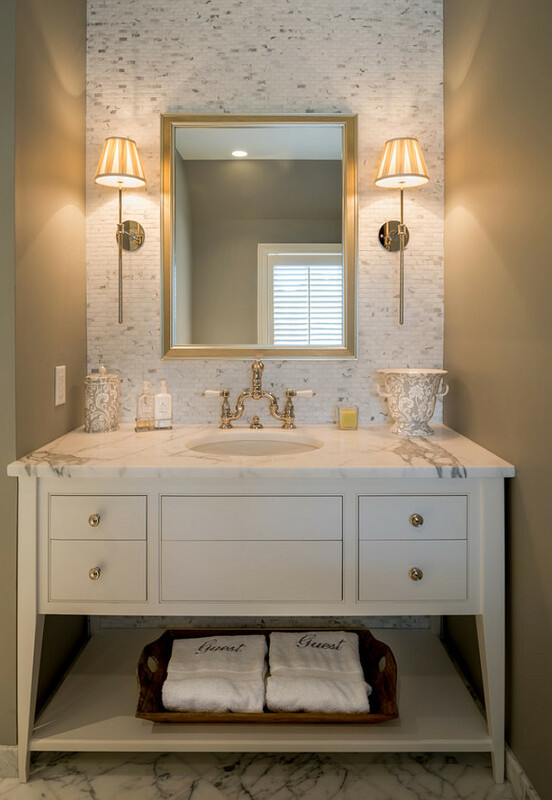 A custom made vanity painted in a crisp white paint is perfectly paired with a marble countertop. Sconces are by Urban Electric Company. 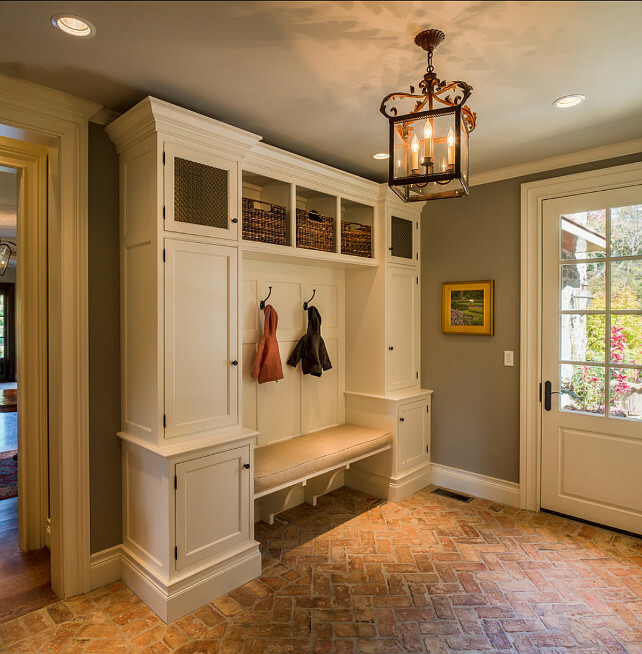 This mudroom is fantastic! Brick flooring gives a rustic and durable feel to the space. 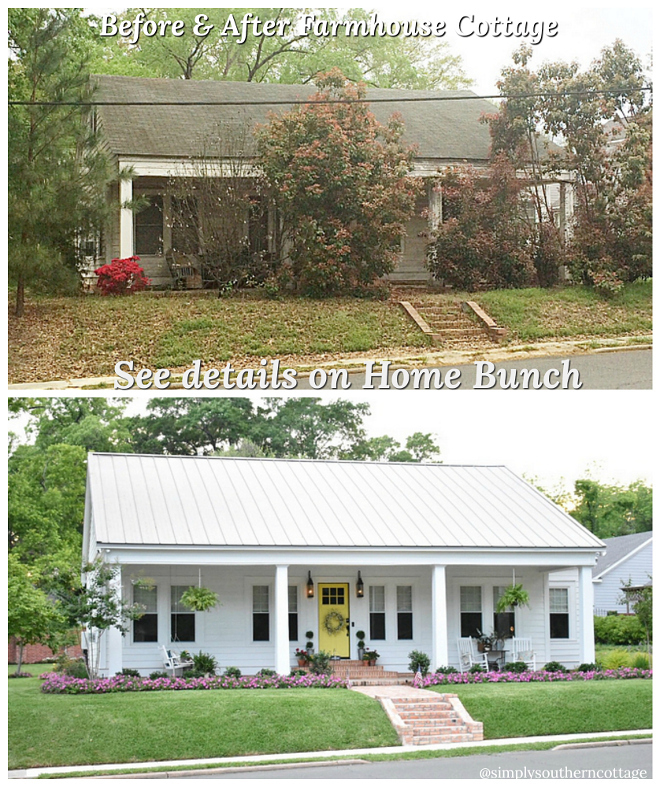 Built-in Dimensions: This custom designed built-in storage unit is 8′-2″ wide by 1′-6″ deep and approximately 8′-0″ high. The lantern is by Circa Lighting. 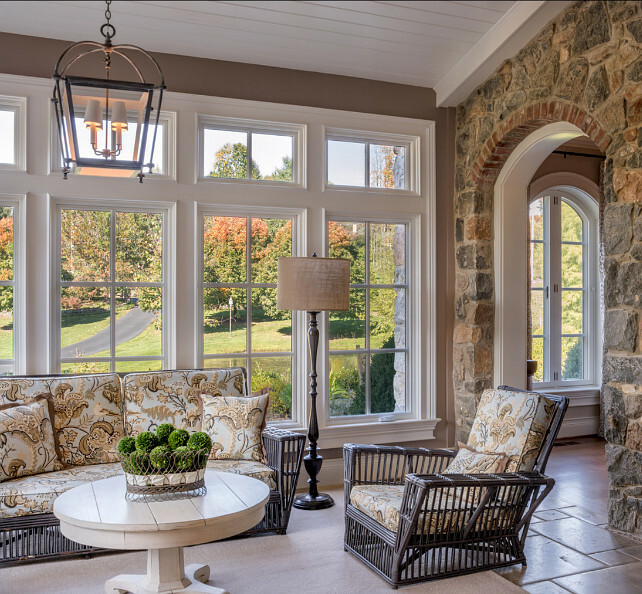 What a great sunroom! The rattan settee and chairs were made in the 1950s and are outfitted with such retro features as drink holders and cubbies for magazines. Floors are Italian limestone tiles. 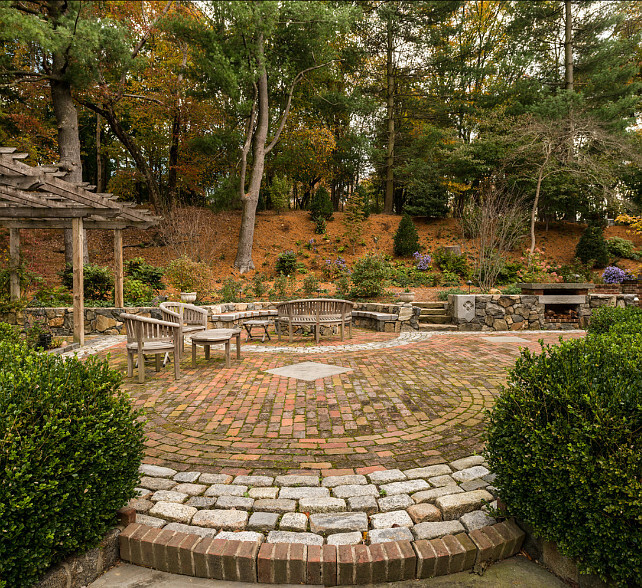 How charming is this patio? I can’t get enough of the many different vintage brick and stones used in this space. This is truly unique and very inspiring. 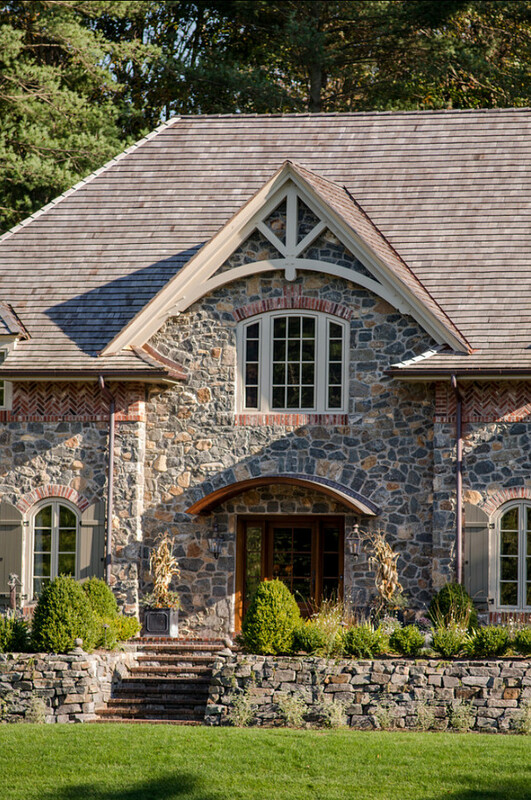 The exterior of the house uses a beautiful combination of brick, stone and siding. Wouldn’t it be nice to have some toasted marshmallows by that firepit? Isn’t this a peaceful place? Even the shed was beautifully designed. Hello, everyone! It’s so great to start a new week with you! We had a fantastic Easter, ate lots of chocolate (if there’s something I can’t resist, it is chocolate… dark chocolate that is!) and had so much fun with the kids. I am also excited because my husband and I are making some great plans for our summer and I can’t wait for it. All I have to say is, don’t wait for a moment to arrive. Plan it and make it happen! Have a Blessed and Healthy week! We’ll see each other here! This house is so beautiful! I love the living room but the wildcat(?) on top of the tall piece of furniture is a bit scary! 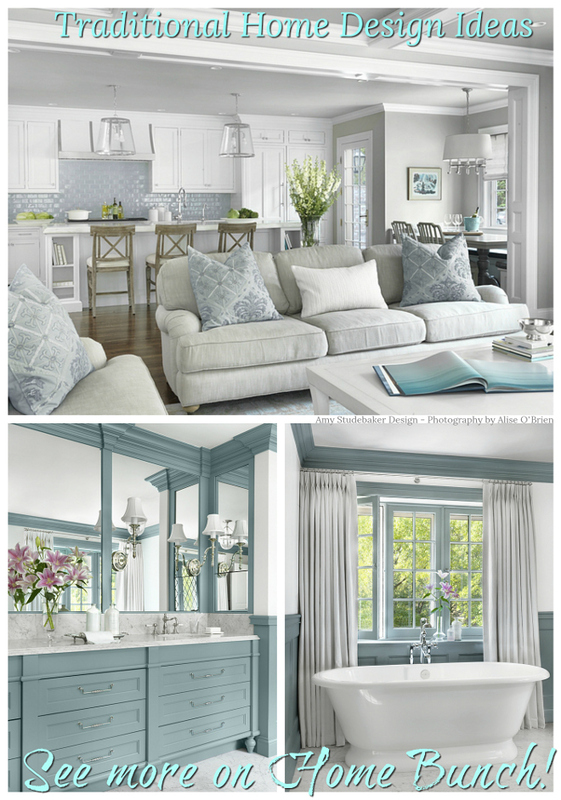 Absolutely beautiful…love all the traditional details. Any chance you know the source for the runner in the hall with the reading nook? Simply beautiful details through out! Epitome of timeless class so often forgotten these days. Truly inspirational! I love the charcoal vanity! Do you know what color this is? What brand are the counter stools in the kitchen? Where can they be purchased? Any idea on the source and color name of the mud room brick flooring?